Marie Antoinette Toast Colours At The Southern Decadence Parade In New Orleans Louisiana Usa is a photograph by Michael Hoard which was uploaded on January 20th, 2013. 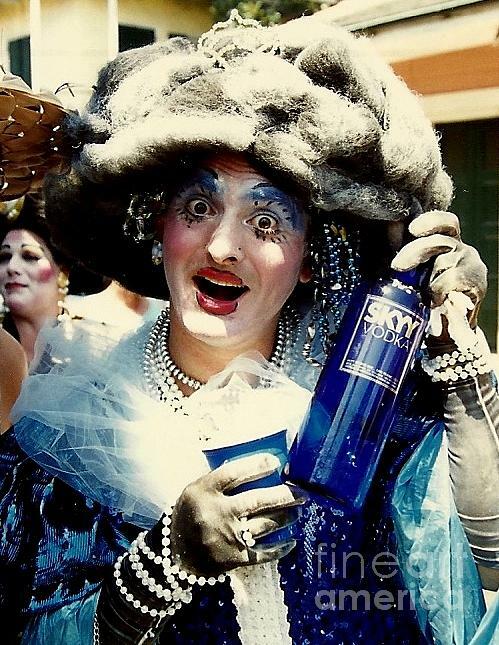 This marcher at the Southern Decadence Parade in New Orleans Louisiana raises the vodka as a toast to me. Dressed in fashions as Marie Antoinette on World Famous Royal Street. This is a yearly event here in New Orleans, Louisiana it originally started as a joke. Some guys where hanging around and thought it would be fun to dress up in ladies clothes and parade through the streets, Well this event bring Million's of Dollars into the City on Labor Day Weekend and not to mention thousands and thousands of visitors from around the world make the anual event. Each year a Grand Marshall is selected and the parade marches down world famous Royal Street in the French Quarter and they stop along the way to refresh there beverages. Sorta like a bar hop. I have 30 plus years of Southern Decadence eye see Colours photos and it just amazes me how much attention and detail these guys put into there costumes. What can I say but its a hoot. Each year a different theme is selected by the Grand Marshal. The individuals who take part in this annual event are from every walk of life. They are Doctors, Professors, Singers, Musicians, Surgeons, Air Line Pilots, 18 wheeler drivers, waiters, bar tenders, parents, policemen, firemen, real estate brokers Lawyers, they are fathers, brothers, nephews, uncles or significant others. This parade is a hoot.! Went through your gallery, you're brilliant, love the clarity of your photos and the excellent composition! This sounds like it was one fantastic party Michael!! love your Marie-Antoinette......looks like she's having a good time! Great shot! v/f! fantastic image ... color and emotion .